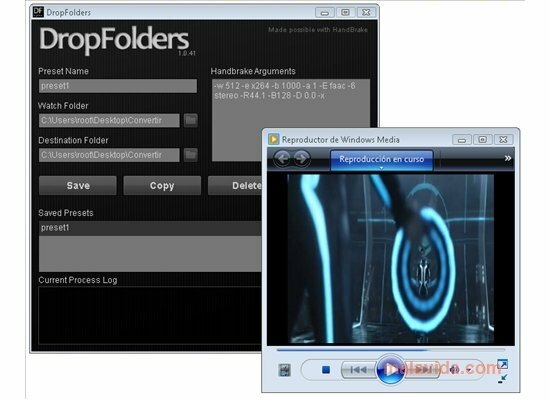 DropFolders will help you to automate the video conversion processes that are so usual nowadays. Thus, transforming your films and video files to the most appropriate format for each occasion will no longer be a repetitive and boring task. This application makes the most of the efficiency and versatility of HandBrake to convert any video. It's actually developed using HandBrake CLI (the powerful command line film converter) as a base application. But to offer the user a graphical interface that at the same time makes it more appealing, it uses Adobe AIR. The most interesting feature of DropFolders is how intuitive and practical it is to handle. As its name indicates, we'll only have to drag any video to the folder that we have previously designated in the program configuration for it to start carrying out its conversion task according to the indicated parameters. Nevertheless, it's essential to know how to work with HandBrake from the command line or to use the presets to be able to make the most of the application. This application requires that you have Adobe AIR installed.